Brexit will leave many areas of UK policy open to change. International trade policy is among the most important of these for UK prosperity and also among the most immediate because the status quo cannot simply be extended. This is the first in a series of blogs reporting what the major political parties say about trade policy in their 2017 manifestos, as they become available. The UK Trade Policy Observatory (UKTPO) has set out a series of issues that it believes should be considered in any election manifesto that might form the basis of the UK’s future trade policy. The table below checks whether or not the Labour Party Manifesto mentions these important elements explicitly or implicitly. Following that we offer a brief commentary on the treatment of trade policy in the manifesto. The Labour manifesto places barrier-free access to the EU at the centre of its post-Brexit trade policy, with an extremely strong statement about “retaining the benefits of the Single Market and the Customs Union” and some discussion of why it wants to do so. This is a very ambitious goal, especially if the stated intention to manage migration involves significantly curtailing inflows from EU member states. The manifesto does not explicitly mention different means of trading services internationally but it recognises the role of foreign-born workers in the NHS, welcomes international students and argues for continuing membership in EU programmes for research. Labour is explicit about the possible need for a transition period in which to complete negotiations with Europe and, through its aim to keep the benefits of the Single Market, it also implicitly accepts the need for mutual recognition agreements with Europe. On international trade, Labour guarantees access to UK markets for least developed countries, but not for any wider set of developing countries. It promises ‘best-in-class’ trade agreements (without offering a definition), and clearly states that it will safeguard the right to regulate in the public interest. It also commits that, despite strong privacy protection, trade agreements must support the digital economy and not impede cross-border data flows. The commitment to the WTO is clear, but there is no mention of the ongoing talks on services. The Labour manifesto does not mention the consumer benefits of international trade; it makes a strong commitment to combat “unfair trade” but this usually amounts to favouring producers over consumers. However, the promise of ‘a Brexit deal that delivers for all regions and nations of the UK’ and a commitment to use ‘trade remedies’ to support key sectors, may be interpreted as implicitly and indirectly supporting the losers from trade. So does the promise to support the export interests of small and medium-sized enterprises. The manifesto commits to “protect workers’ rights and environmental standards” and this presumably extends to trying to prevent trade agreements from diluting them. One notable area not included in the list of trade issues for reviewing manifestos, but figuring strongly in UKTPO’s previous analysis (Briefing Paper 8) is Labour’s commitment to join the WTO’s Government Procurement Agreement and in a way that allows procurement to support public policy objectives. 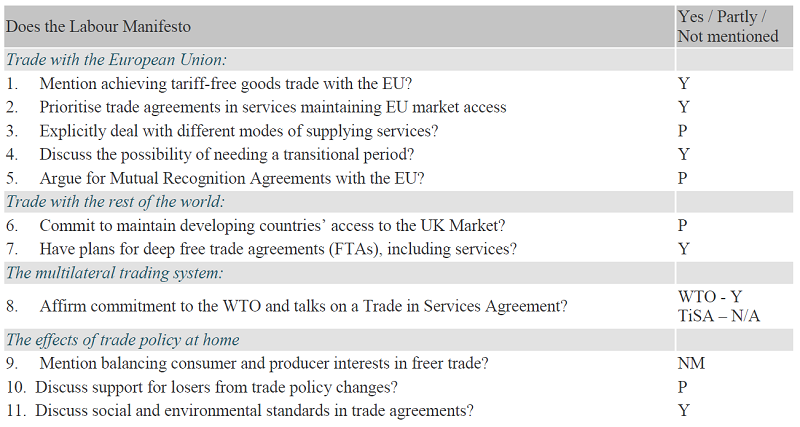 While the UK Trade Policy Observatory (UKTPO) takes no institutional position and will continue to remain firmly non-partisan during the UK General Election, it believes it is useful to share some of the questions that its fellows think will be important when reviewing what the party manifestos say about trade. Examining manifestos is particularly important, because the winning party’s manifesto may be cited under the Salisbury Convention, which precludes the House of Lords from opposing bills passed by the Commons to honour election manifesto pledges. The opinions expressed in this blog do not necessarily represent the opinions of the University of Sussex. There were a few other commitments relevant to the negotiations with the EU scattered through the manifesto. p. 22 to maintain access to European energy market and to Euratom; p. 25 adds the European Medicines Agency and Erasmus; p. 92: maintain membership in EU Highways of the Sea and Common Aviation Area and Open Skies. Some of these are relevant to trade with the rest of the world. There was a general statement favour of low tariffs, but there were also commitments to strengthen AD (especially for steel), p. 30, and to continue to protect farmers from ‘cheap…produce’ and ensure access for agriculture to EU markets, so to preserve the CAP. In the context of the previous/current government and the European Commission supporting ISDS, and the recent Singapore ruling on Commission competence for investment (i.e., a post-Brexit FTA with investment would need individual member state approval across the 27 member states), this seems quite an oversight.